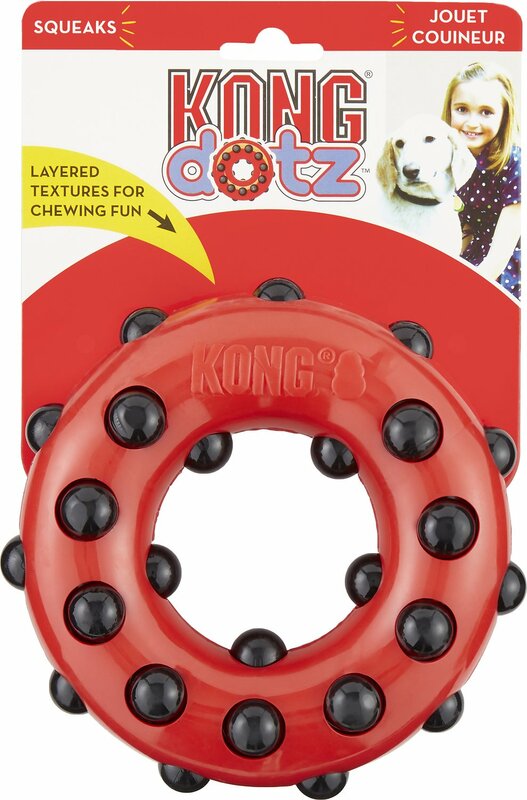 Help your dog spend his boundless reserves of energy with the KONG Dotz Dog Toy. This long-lasting chew toy will provide hours of playtime for you and your furry friend. It’s made with layered textures to provide a variety of chewing fun. 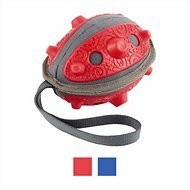 Its playful, unpredictable bounce makes it exciting for your dog while promoting healthy exercise. Plus, the nubs help clean his teeth and gums to promote dental hygiene. Designed to encourage positive play and teach your puppy healthy chewing habits from an early age while discouraging destructive chewing. Erratic bouncy toy will keep your pal engaged and having fun while promoting healthy exercise. 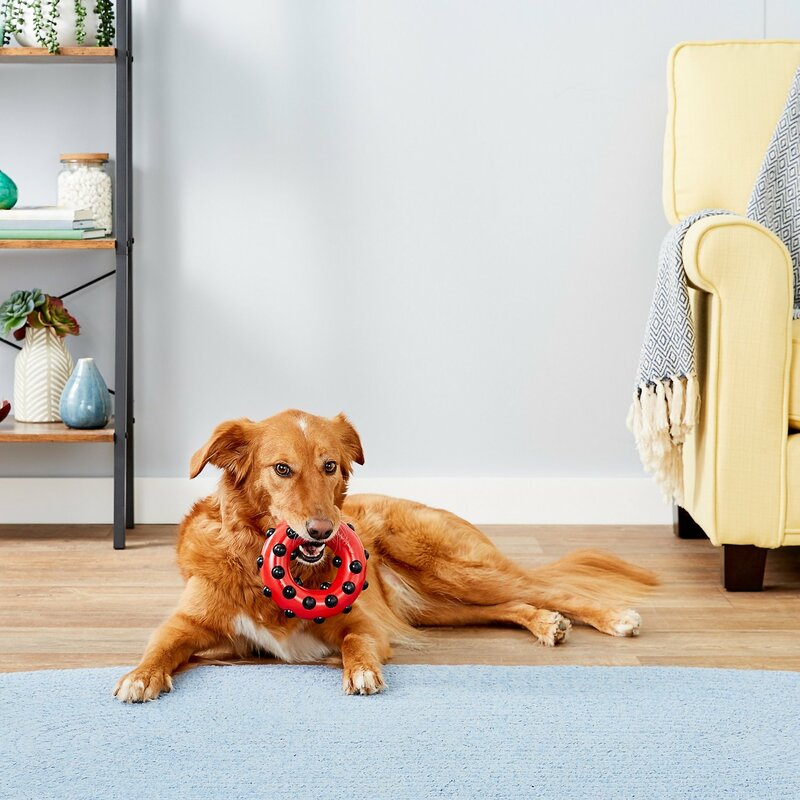 Made with layered textures and built for long-lasting engagement to keep your furry pal happy, busy and entertained for hours. Nubs help to clean teeth and reduce plaque and tartar while promoting healthy teeth and gums. The rubber toy is a great way to have more interactive fun with your pal—just flick it and let your furry best friend try and catch it. This is one Kong toy I would not buy again. It was a birthday present for my baby rottie, and didn’t last as long as the birthday cake! She was able to chew off the “nubs”, and chewed off a corner. Needless to say I had to take it away from her. What a huge waste of money. I do grade school demos with police K9 teams. As a thank you I purchase toys and treats for the teams. I tried this item with my last K9 and of the 6 toys I provided this was by far his favorite. Need I say more?!!!! This toy has stood the test of time for our little chewer. We bought it a couple of months ago after our puppy destroyed a number of other brand dog toys in a matter of hours/days. We wanted something that wouldn't be easily broken into pieces, and this toy is just that. He chews on it every single day and it has held up VERY well. The little round pieces are the only things that he has been able to 'chew off' in any capacity, and even that has taken a very long time. The main part of the chew toy is virtually indestructible. It bounces when tossed and has made for a great 'fetch' toy as well. I was excited to get this toy because I love the Kong brand but Luna got the black dots off within minutes. Already in the trash! This is a bad toy. My dog bit off pieces in a matter of 10 mins. I do not recommend this toy!!! No more Kong toys for us. We will stick with Nylabone products. I bought this thinking the Kong brand would be a better quality toy. My Spaniel chewed off the black knobs and the red outer layer (circle version) fairly quickly. We had to throw it away to prevent further destruction. Kong did not live up to its reputation with this product! Not happy with this Kong chew toy. My dog is 3 yrs old and he completely chewed the corner off ( bought the triangle toys) within 5 min. I have always had good luck with Kong toys except for this one. Had to give the other toy (bought 2 of them) to a friend. Very disappointed with this KONG product. 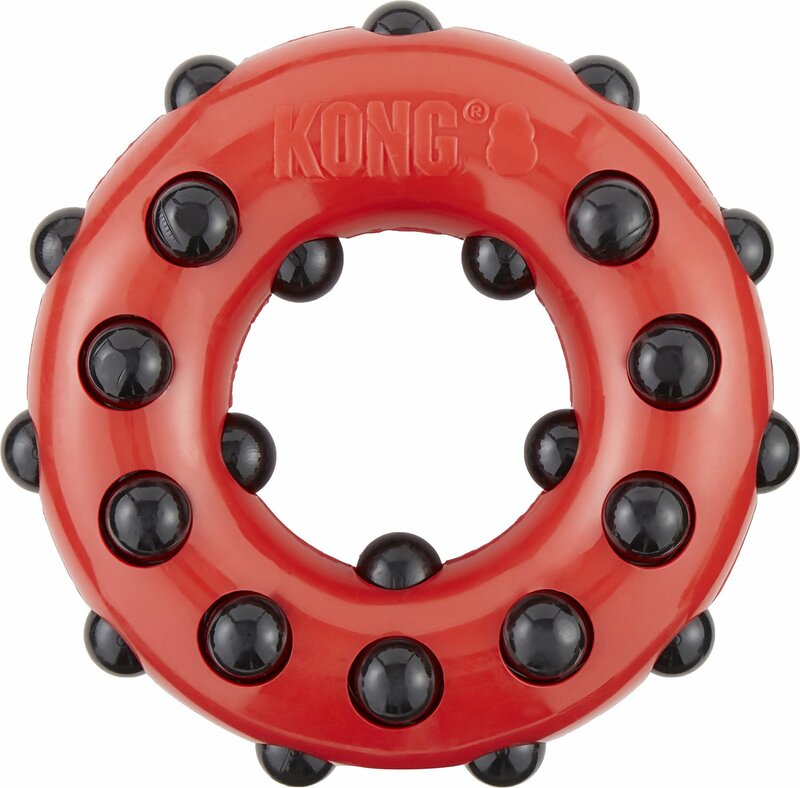 The round knobs can easily chew off and the quality isn't like other KONG products. This toy lasted less than 1/2 hour before I had to take it away from my chocolate lab.